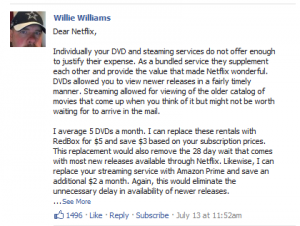 July 22nd, 2011 | Author: Billy Strawter Jr?rel="author"
In a nutshell, Netflix adjusted their price structure and raised prices by 60%. They took something that consumers perceived as value and just like that gave them reason to question the expenditure. Looking at the Netflix Facebook Page there are over 78,000 comments related to the announcement. Many of the comments share the same sentiment. Customers simply aren’t pleased with the increase. Part of it could be the way the announcement was presented on Facebook. The status update doesn’t offer much in the way of explanation, but links to a blog post on Netflix explaining the price increase. The blog post alone has 12,000 comments with over 4,000 shares on Twitter. Talk about social media working on all cylinders. Unfortunately in this case it’s not the right kind of buzz. They didn’t do themselves any favors either as Netflix was deleting customer complaints from Facebook. What are the glaring issues here? Fix: Do your homework. Understand why your customers appreciate your product/service. Spend time answering the “what if” by surveying some of your best customers before making changes. They didn’t ease into the transaction and had to quickly backtrack by offering a discount to customers, further devaluing their product. It was already too late. Certainly they lost customers who will never come back. Fix: Give your customers time to adjust to the changes. Making the switch quickly can backfire. Price and value must go hand in hand. By not understanding the price point at which customers perceived the most value they again misunderstood the marketplace. 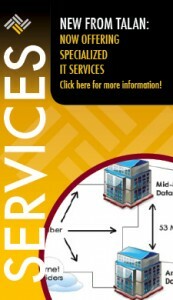 Fix: This is an important aspect of any business. Make sure that you know when and where price and value are in alignment. If it’s not easy to find, figure out a way to create it. That’s where marketing comes in handy. Social media hasn’t helped, but it could have. 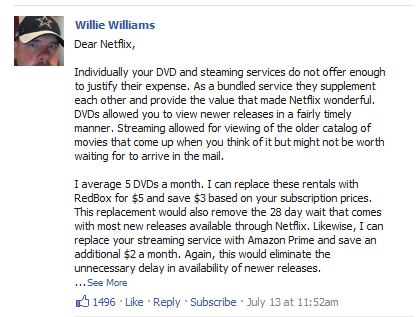 Netflix could have easily utilized social to address many of the issues above well before announcing the price increase. 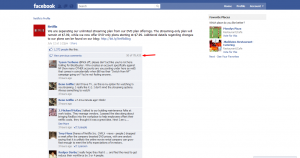 They have 1.9 million fans on Facebook certainly they could have found a large enough sample size to survey. Besides social media they could have reached out to customers via email by way of surveys. From a business strategy standpoint it makes perfect sense. Changes needed to be made, but when a strategic change backfires you’ve got major issues. Part of what we do here at Talan is help small business navigate these sort of minefields. We help business develop a strong strategy whether it be marketing, PR, exit strategies, or social media. Understanding the risk associated with your decisions is an important part of being an entrepreneur. Not doing so comes with enormous consequences. If you found your company in this position how would you react?